That’s exactly the beauty of origami – taking something as insignificant as a scrap of paper and turning it into a beautiful creation. It’s no wonder then, that this art form that has been around since the sixth century still retains all its original charm. 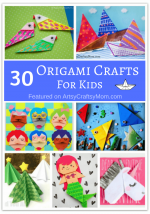 Origami is the Japanese word for the oriental art of paper folding. Ori means to fold and kami means paper, and together the word refers to the craft of folding paper into objects without cutting, pasting or decorating the paper. 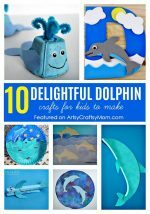 This form of craft has been practiced in the Orient for centuries, and involves certain paper folding techniques with which you can create animals, flowers, boxes or anything your heart desires. Today, we’ve got a cute little origami whale for you, with a full step-by-step tutorial! 1. If your craft paper is not a perfect square, you’ll need to make it a square of either 10×10 or 12×12. Fold the paper diagonally from one corner and cut off the excess. 2. Fold inwards from one side to meet the crease in the center (make sure the blue side of the paper is outside and the white stays inside). 3. Fold in a small triangle from the top to make the face. 4. Fold the paper longitudinally in half. 5. Make a fold at the other end for the tail. 6. With a pair of scissors, make a small slit at the folded part of the tail so that it can be separated. 7. Make smaller folds at both ends of the tail so that it looks like the picture. 8. It’s time to fix the eyes! You can either stick on small googly eyes or just mark them with a black sharpie. Your adorable little whale is ready to hit the water! Have you heard of Storigami? 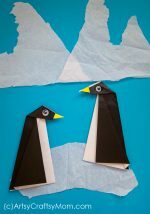 It’s what you get when you take storytelling and origami and put them together! It’s a nice way to illustrate a story as well as a clever technique to learn a fold and remember it. 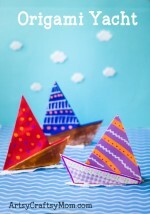 Origami is known for several mental and physical benefits, besides keeping you occupied and out of trouble! 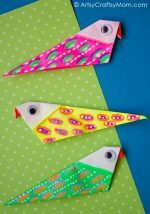 Origami is said to stimulate both parts of your brain and it also promotes better concentration, hand-eye co-ordination, reasoning as well as math skills. Looks like there’s no reason not to make this whale now!! Let us know how you liked our Origami whale and how it turned out for you. 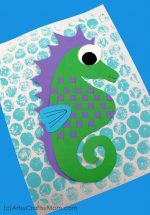 Be sure to check out all our crafts and activities for kids. Happy folding! Sushma is an avid crafter with interests in Mehandi/henna, jewelry making, and Kids crafts. She is a Mum to boisterous twins and writes posts for our Art & Craft Section.